But did you know that there is an even more unique way of cooking those meat racks? That’s right; smoking is a wholly different process than grilling. Here in smoking, we can concentrate all the juiciness of the meat because in this process the protein does not lose much moisture and thus, can be cooked in its own juices. Why use a smoker when you can just grill it? What you did not know is, the traditional barbecue is smoking only, where the meat is smoked in low temperature for a long time, so that the meat gets infused with all the smoky flavors from the flavorsome wood and gets cooked with all its juicy magic inside. The best part of cooking by smoking is, heat is used indirectly, so the process is quite slower. And slow cooking is definitely one of the best ways of packing the flavors in. so what you get as a result is an extreme bomb of flavor and lip smacking deliciousness, with the meat that literally melts in your mouth. So why are you holding back from holding the next smoking session at your backyard? Be it any weather or any time of the year, nothing beats the happiness of getting together with the whole family and friends with some great tasting food. So if you are planning to host a party in the near future, make sure you know the basics and pro tips of smoking the charcoal and guess what? You don’t need to be a pro smoker for this. No matter how you smoke, be it the traditional woods over coal method or your regular kettle grill, with this tips you can master the techniques of charcoal smoker very easily. The first step first, Prepare your coals for long and slow cooking time: the key is to use both burnt and unburnt coal to keep fire going for longer period of time. You can use a Two-zone fire with a parallel configuration, where you pile lit coals on both side of the grill and a blank space at the center. In this void, you place a foil-pan filled with hot water to control the temperature inside the grill and add moisture. Wood chips are added along with the coals for extra smokiness. In this process too, a foil-pan with hot water is placed in the center. When the coals will be burnt down by some hours, add your meat. If you need some more time for cooking, keep on adding more briquettes. Placing a foil pan filled with hot water at the middle position of the smoker. The main trick is to control the temperature inside the grill and add the required moisture to the meat. Adding the water adds a protective layer of moisture that protects the meat from any dramatic fluctuation of heat. Wood is the key ingredient of imparting the smoky flavor in your meat. That’s why it’s super important to choose the correct wood for smoking. Usually, hickory, mesquite, oak etc., are ideal for beef and pork. Whereas woods like fruit woods are slightly milder and ideal for soft meats like pork and chicken. Try to keep the temperature around 225-250 degrees. You can check the temperature by a meat thermometer. This hinders the cooking process. You don’t want the vapors to evaporate from your meat. This will make the temperature fluctuate and your meat dry. Don't forget, you should clean your cast iron grill grates regularly after grilling. 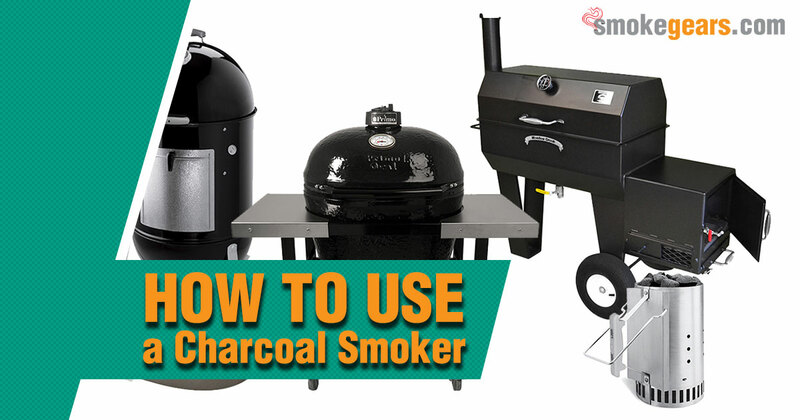 If you remember the above mentioned tips and tricks at the time of using a charcoal smoker then you would be able to get the best out of it for sure. Happy Cooking!